The Office is gone but definitely not forgotten. Do you still thirst for the Michael Scott, Jim Halpert, Pam Beesly, Dwight Schrute, and the Dunder Mifflin gang? Well, you can satisfy your hunger for the classic TV sitcom at this restaurant that serves The Office themed food. The Woodland Farm Brewery offers a full menu of The Office inspired cuisine. The Woodland Farm Brewery is not located in Scranton, but it is in Utica, New York, which has a branch of Dunder Mifflin and was involved in the epic Branch Wars. 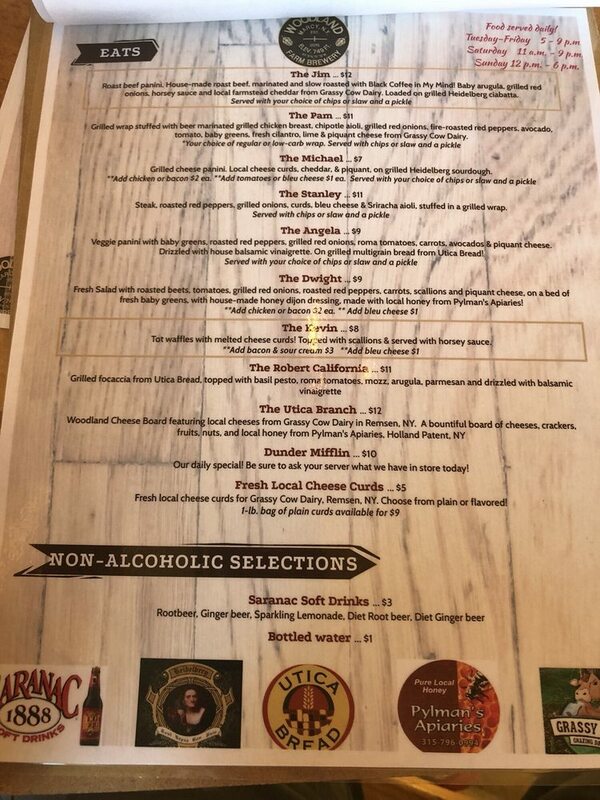 The menu at the Woodland Farm Brewery, which has a 4.5 rating on Yelp, has sandwiches and salads named after your favorite Dunder Mifflin employees. There’s The Jim, The Michael, The Angela vegetarian wrap, and The Dwight which of course has beets. Let’s hope that they are very nutritious, but don’t smell like death. Here is the menu from the Woodland Farm and Brewery. But there are some obvious menu items missing. Like where is Jim’s Big Tuna Sandwich? Where’s Jim’s Meatball Hoagie? You absolutely need to have Kevin’s Famous Chili. No Stanley’s Pizza in a Pouch? Sadly there are no Nellie tacos. And there isn’t even stapler Jello for dessert. Let’s hope they at least serve roast roadkill goose with wild rice dressing on Christmas.